Please Note: The Geovision GV-SNVR0411 is no longer manufactured. Please refer to the Geovision NVR page for a replacement. The Geovision GV-SNVR0411 is a standalone network video recorder capable of supporting up to 4 Geovision IP cameras. The Geovision GV-SNVR0411 records to an internal hard drive in up to 4K resolution (3840 x 2160) on all 4 channels using the H.265 or H.264 video compression. Instead of using a separate POE switch or injector to power the cameras, the GV-SNVR0411 has 4 POE 802.3AF ports built-in to power the cameras directly from the NVR. In addition to POE ports, it also features a WAN port to connect to the local network. With a 4K HDMI video output that connects directly to a monitor, it eliminates the need for a separate PC to view and playback recorded video from the unit. This NVR has 3 USB ports that can be used to connect a storage device to import or export settings, update the firmware, save snapshots, and save the recorded video in AVI format. PTZ cameras can be controlled using the onscreen controls or with the optional GV-Joystick V2. 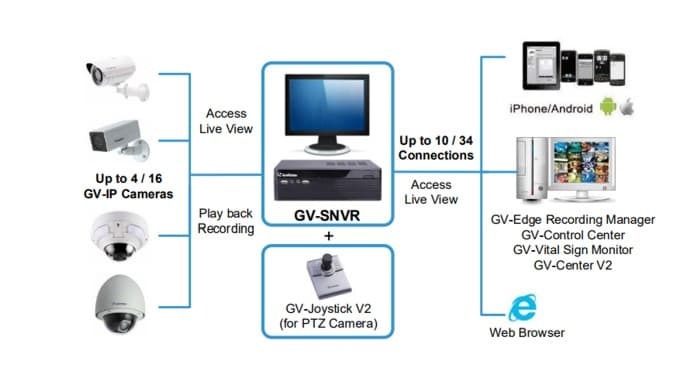 The Geovision GV-SNVR0400F can be remotely accessed from a number of devices including Windows PC, iPhone/iPad, and Android mobile devices. 2. The GV-SNVR0411 supports the recording bandwidth of up to 40 Mbps only.